Life goes on in the Tibetan plateau but with a postive change. The Dedan Clinic now has a doctor and a nurse. This wouldn't be possible without the encouraging feedback from our supporters. From the donations, Dr. Norbu, who is educated in both Tibetan and mordern medicine, is receiving Yuan 700 a month ($94). The nurse is receiving Yuan 150 a month($19.50). Here are some of the pictures that Don just sent, http://picasaweb.google.com/himalayanmentor/HealthClinicUpdate. As you can see from the pictures, there is more to do and slowly but surely, we hope to fulfull the basic needs of the 700 villagers of Serlung-Bertse. From what we know, some of the needs are to improve the clinic's floors. You can see from some of the pictures, it is made of mud and could be upgraded. We also have plans to devise ways to plant vegetables by installing portable greenhouses. Now, does that bring up the idea to add a small technical school to do quick practical trainings on sustainable projects such as solar, irrigation systems, animal husbandry, etc.?? Again, we are very fortunate to have Dr. Norbu helping Dedan Clinic. Also, for us to realize that it is very difficult for remote areas of the highlands to attract and retain qualifed professionals such as doctors or teachers. This infomation comes from past experiences and projects. In fact, even after being paid three times the average, professionals usually don't stay and move-out. 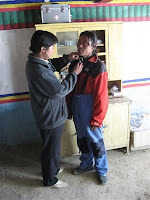 Dr. Norbu is also somebody who was brought up in Serlung and is fluent with the local culture, customs, and language. We will have more progress stories from his side in the future. Thuk-che and tashi delek.